Yard mulches come in many materials, weights and colors, but all prevent weed growth and soil erosion. The weight of yard mulches varies considerably, depending on the material and its condition. For example, dry organic mulches are very lightweight, but moist grass clippings, shredded leaves or wood chips weigh more. Apply wet mulches in thin layers to allow them to dry out. Consider cost, use and plant selection when choosing mulches. Yard mulches vary in weight, and are available in many organic and inorganic forms. 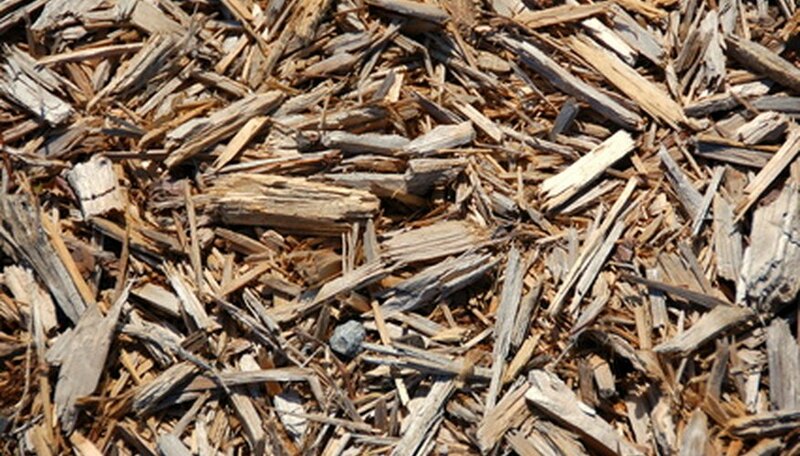 Common organic yard mulches include wood chips, shredded bark, grass clippings, straw or shredded leaves. These materials break down over time and are usually used in vegetable gardens or perennial beds. Inorganic mulches, such as gravel, rock or shredded rubber, do not break down and are suitable for permanent beds containing only shrubs or trees. Organic mulches are sold dry and are generally lightweight, while rock and gravel are quite heavy. Rubber mulches fall somewhere in between. Mulches are sold by the quart or cubic foot in bags at nurseries, or by the cubic yard in bulk at landscaping supply companies. Organic mulches may weigh less than 1 pound per cubic foot, while rocks and gravel may weigh 5 to 15 pounds per cubic foot. When choosing a mulch, consider not only the weight of the mulch, but its potential benefits and drawbacks. Organic mulches add nutrients to the soil and improve its texture and drainage, but they break down and require frequent reapplication. Inorganic mulches are permanent, but they may compact the soil and retain heat. They may also restrict plant growth. Bagged mulches are suitable for small landscaping projects, but bulk mulch is more economical for large areas. Most landscaping companies offer delivery, although the charges are hefty. Borrow a friend's truck instead, or rent a truck from a home improvement store. Unload the mulch in a pile at your driveway for later distribution. Fill a wheelbarrow with the mulch to transport it to the desired location. Lightweight organic mulches are easy to spread, while rocks and gravel require more effort. Spread mulches at least 2 to 3 inches deep for the best effect, but avoid placing them directly against plant stems and trunks. Tip the wheelbarrow to dump the mulch into the flower bed, and then rake the mulch to level it. Organic mulches may blow away in the wind, but inorganic mulches stay in place because of their weight. A layer of landscape fabric below the mulch helps prevent weed growth. What Are the Drawbacks and Problems With Coconut Mulch ? How much land will 1 cubic yard of mulch cover?